Driving into Paris on the contiki coach was magnificent, seeing the Eiffel tower defiantly not in Kansas anymore. I am not saying I do not like Paris but i did not feel what people are suppose to feel when they visit Paris, it was a different experience that is hard to explain but never the less has defiantly have taken into consideration of how I live my life, always moving forward. As I say every time I visit Europe it changes me, I do not know how but it changes my outlook, perspective and i am more sure of who i am after each visit from Europe. Safety. I did not feel comfortable walking around the city always cautious on how i was carrying my bag. As the first night we were touring around the city, and the bus dropped us off to have dinner and whoever wanted to go back to the hotel was to meet at a specific spot to get back onto the coach or continue exploring Paris and take a taxi back to the Hotel. Some of us went back onto the bus and as we were driving onwards back to the Hotel, we happened to see a mugging or fight. Not to sure what it was but by the looks of something, one guy was trying to take another gentlemen fanny pouch of some sort and he was getting mad, and the third guy was trying to hold him back. Weather. Do not go to Paris in December/January it is rainy and cold and nothing is open New Years Day so not much for you to do except for walking the hallways of the Louvre, which is not a bad thing because that place you can take two days and still not see everything - it is defiantly the place of art :), or walk the streets of Paris or do people watching at a local cafe. Time. The length of time i was in Paris was short. Arrived December 29 and left January 2. I am sure if i have been in Paris longer and actually got to see and spend some time I would have enjoyed Paris much more, Not saying that I did not enjoy Paris. Just the fact that it was too short. Although I feel i saw more of London then i did of Paris and i was in London for shorter if not the same amount of time. You defiantly need 5+ days in any destination you travel to. Getting around. Especially from the Contiki hotel we stayed at, to get into Paris. It just seemed quite far. Until you get into Paris, for example we exited the Louvre and planned on finding the Metro to take us to Notre Dame but instead it turned out to be a few blocks north, which was nice that it was semi close by. The Metro was a little bit harder to figure out, which track to take to get us to this destination and so forth. 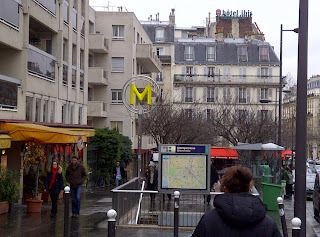 I do not know why but I did not feel safe riding the Metro in Paris. Language barrier. I had forgotten my translation, lonely planet french book at home so I did not have that with me. Which if i did have so i would have felt more comfortable communicating and be more willing to try. I had not taken a French lesson since elementary school, even I had burrowed some french discs from the library and listened to them each and every day was still not the right approach to learning a new language. Beggars. Especially watch out for the deaf people that try and come up to you to ask for money. Oh my gosh, i have not seen that many Vendors in Paris since my trip to Italy and still then I think Paris has Italy beaten for how many vendors they have. And most of the Vendors are ripping you off. Best bet is to buy your souvenirs in a store on the streets of Paris - that is how i bought my Key Chain Eiffel Tower, for 0.25 Euros. Watch out for the Gold Ring & String Ring Scam... especially on Montmatre & Champs de Mars. Gold Ring Scam: a quick and simple summary; A Girl drops a fake gold ring in front of a tourist and tries to persuade him/her to buy it for far more than it is worth. Alone. Would have been nice to have someone to share New years in Paris with. Although it did help having Doug, a previous Contiki friend from a previous tour there. It is tough traveling alone and I give myself a lot of props traveling around the globe by myself meeting strangers that soon become friends, Thanks Contiki Holidays for making it easier to travel by one self. Groups were separated. There were two buses with 50 people on each bus and there were a few people that i had met few months prior on facebook that i have only got to meet one day prior to the tour in London. It would have been nice to have been in the same hotel at least or close to.Just would have been more fun to have more people to share the experience of Paris with and get lost walking the streets with. Lovely post and useful information. I particularly will watch out for that fake gold ring. I have never been to Europe and this one is a good read for Paris. New Years was cold and the wettest too and to top it all off hardly anything was open. Defiantly need to visit Paris in the summer. Your the first i've heard that Love Paris.